Crock Pot Turtle Brownies - Recipes That Crock! Ooey gooey….scrumdiddlyumptious…amazing…awesome! Yep, I think that is a good way to describe these delicious Crock Pot Turtle Brownies. So I told Michael that I wanted to come up with some recipes this week and asked if he had any suggestions. He thought for a minute and said, “Crock Pot Turtle Brownies!” I was completely surprised since I am the one with the sweet tooth in our family, but I wasn’t about to turn him down. Yum! Here’s your fair warning on these Oh-My-Goodeness-These-Are-So-Good Crock Pot Turtle Brownies are ooey gooey and irresistible! Now when I say they are ooey gooey, I mean they are ooey gooey! This recipe has a whole bag of mini marshmallows and a small bag of caramels in it…so when it all melts together, the only way I can think of to describe it is ooey gooey! These are best served warm. And if they get too cold, you will want to heat them up again because the caramel will harden if it gets too cold. However, if you take this to a potluck, they won’t make it long enough to get cold…they are that good! 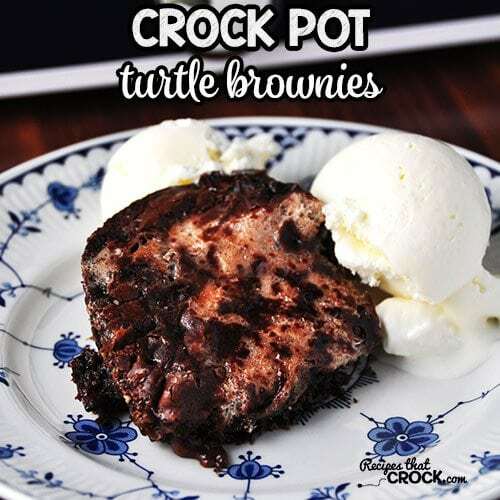 These Crock Pot Turtle Brownies are to die for! 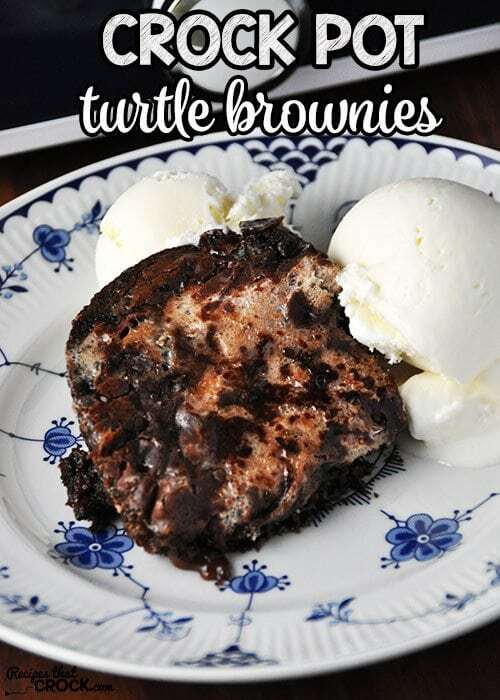 My 9 x13 casserole slow cooker made by Crock Pot is perfect for these Crock Pot Turtle Brownies. Brownie mixes just go well in a 9×13 pan, so it only makes sense. If you don’t have one, go order it right now. Seriously, you won’t be disappointed! BUT if you want to make this recipe before yours arrives, I would use a 5-6 quart slow cooker. Has anyone tried making double batch in the same crock @ the same time????? The single batch filled up my casserole crock, so I wouldn’t double it if you are using a casserole crock. I have not tried it in a 6 quart or larger crock though. If you do try to double it, watch it closely as you cook it. You don’t want to burn the edges or have your center not cook completely. Let me know how it turns out. Enjoy!